Summary Qualcomm Atheros based 2.4 GHz only N450 router with 10/100 Ethernet ports but no printer or storage sharing. We recently have been focusing our router coverage on the new crop of 802.11ac routers. If you haven't been following our coverage, the new 802.11ac standard, currently pending ratification, provides significantly improved throughput in the 5 GHz band. But the new standard doesn't officially change anything for wireless networks operating in the 2.4 GHz spectrum. Those networks still abide by the 802.11n specification. Not everyone wants or needs dual band routers that offer simultaneous 2.4 and 5 GHz networks. Nor do they need the performance gains offered by the 802.11ac draft standard. Further,wireless clients included in mobile devices or notebooks often operate only in 2.4 GHz. And it's no secret that routers operating 2.4 GHz band provide greater coverage than those in the 5 GHz band. What many people need is a single-band 2.4 GHz router that offers broad coverage with good performance. 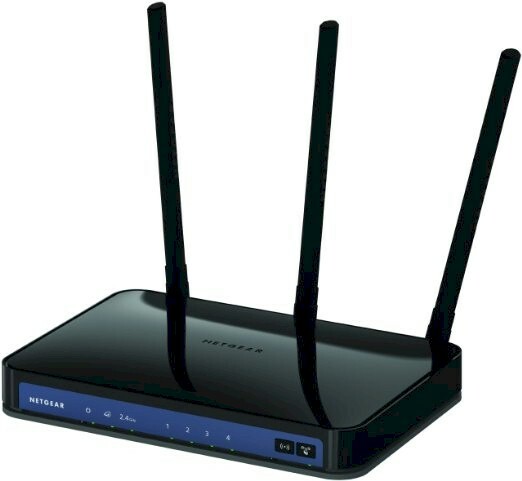 With a street price of about $60, NETGEAR's WNR2500 higher throughput (if you use it with N450 class devices) and extended range with all devices at an affordable price. And we found it delivers. The image below shows the WNR2500's front panel. The LAN LEDs show solid green for a 100 Mbps connection and amber for a 10 Mbps connection. The Wi-Fi button lets your disable the wireless network without logging into the user interface. The WPS button initiates a WPS session and its corresponding LED indicates that status of the connection. There's nothing too exciting about the rear panel. You'll find color coded LAN and WAN ports, three 5 dBi omnidirectional antennas and a power connector. If you're the type who hates instruction manuals and prefers not to read the quick-start guide, you'll appreciate the label on the bottom of the router. It provides you with the router's default login URL and credentials. The image below shows the top side of the circuit board with the shield removed. The right hand rectangle contains the QCA9558 dual-band, 3-stream 802.11n system-on-chip (SoC). This is the same chipset that is used in the TP-Link Archer C7, D-Link DGL-5500, and EnGenius ESR1750 routers. Also in the same rectangle you'll find the 32 MB (RAM) Windbond W9425G6JH-5. In the left rectangle you'll see the three 2.4 GHz amplifiers (unidentified -marked 6536691E330). Adjacent to the 2.4 GHz amplifiers, note the empty space on the board - presumably for 5 GHz amplifiers for a dual band version of this product. Rounding out the major components, there's 4 MB of flash (Macronix MX25L3206) and an AR8236 5 port Fast (10/100) Ethernet switch.